This week's Download of the Week is a real trip down memory lane, particularly since it's from the first year of official Drum Corps International videos that still exist. Unfortunately, at the time, no one in a position to preserve our history for posterity thought there would be any demand for consumer videos. For those who weren't around in 1974, it helps to know that the first home VHS (Video Home System) wasn't introduced to the United States until August 23, 1977, four days after the 1977 DCI World Championship Finals. 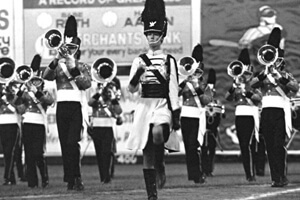 An upstate New York television station taped a number of corps at the 1974 DCI World Championship Prelims in Ithaca for a local news program. Tragically, one of the two tapes that were recorded was re-used to record a station broadcast. An employee of the station, thinking ahead, personally "borrowed" the remaining tape and for that reason alone, we now have video recordings of the top three corps (Santa Clara Vanguard, Madison Scouts and the Anaheim Kingsmen) from the 1974 World Championships. No official tape was created at the Finals. Two years after winning the first DCI Championship title, Anaheim Kingsmen came close to taking a second championship in 1974. In Prelims, the corps placed second, 0.90 under the Madison Scouts and 0.25 over Santa Clara Vanguard, the eventual champion. This was the last time the corps would be in the top-three. It was also the last time the corps would make it into the Finals. The corps didn't make it to the field in 1975 but returned in 1976 in 19th place, a position duplicated in 1978. The year between looked as if the corps was coming back due to a 14th place finish, but by 1982 and then on (until the corps disbanded after the 1986 season), 28th place was the highest position it would attain. Performance excerpt of the 1974 Anaheim Kingsmen. DCI Hall of Fame member Bobby Hoffman wrote the corps' drill in 1974, one year before going to the Blue Stars and two years before reinvigorating the Bridgemen with a totally new look and attitude. The Kingsmen show opened with Leonard Bernstein's "Dance at the Gym" (from "West Side Story"), more commonly known as "Mambo." The energy level of the brass and drums was one of the most searing sounds to ever be heard on the field. "March to the Scaffold" from "Symphonie Fantastique" by Hector Berlioz would not allow any rest, followed by the drum solo of "Tubular Bells" by Mike Oldfield, (the theme from the hit movie, "The Exorcist"). A return to the Berlioz featured lots of brass rips and razor sharp articulation. Stan Kenton's "Artistry in Rhythm" was the concert standstill piece of music. As hard as it may be to believe for those born in the past three decades, in this era every corps had a concert standstill where everyone – well – just stood still for an entire production. This was the part in the show where a corps could highlight the musicianship that couldn't be adequately featured when everyone was moving around. Also, drum lines continuously stayed tightly together on the 50-yard line throughout the show, with the exception of entering from the left and/or leaving to the right, a holdover from earlier days. The ballad consisted of Tower of Power's "So Very Hard to Go" that demonstrated that the brass musicians had some tenderness ingrained in them, but it was only temporary, as the finale from Igor Stravinsky's "Firebird Suite" hammered the audience into submission with its brute force. When the scores were announced after the Finals, Kingsmen's 88.55 was only 0.95 from Santa Clara Vanguard's winning score. (Under the scoring system at the time, it wasn't until DCI's fourth year in 1975 that the winning corps broke 90 points). The corps was the only finalist that wasn't assessed a penalty, which usually happened when a color guard member dropped a piece of equipment. If you were to ask a member of the guard back then how the corps had no penalties in Finals while other corps had as much as 0.80, they likely would tell you that the Kingsmen guard members were not allowed to drop. And they would mean it. Big time. This week only, you can save on 1974 World Championship Audio and Video Performance Downloads on the DCI Fan Network. Buy the 1974 Anaheim Kingsmen Video Performance Download. (Available this week only for $3.99. Regular price: $4.99.) Buy the Audio Performance Download bundle of all 12 Finalists from 1974. (Available this week only for $15.99. Regular price: $19.99.) Offer ends Monday, Sept. 5 at 8:30 a.m. ET.